The iOTA Programme will provide support to businesses and individuals across all sectors and throughout the geographic region of East Border Region. The goal will be to positively impact on those individuals, SMEs and micro-enterprises by a combination of appropriate assistance under the iOTA programme. This will include raising innovation awareness and encouraging individuals and businesses to become involved in innovation, helping to generate innovative ideas, potential business concepts and processes as well as assisting existing businesses explore how they can innovate to expand and grow their businesses. Support provided to help established businesses to embrace innovation and grow. Participants can avail of Road Shows, Innovation Clinics and Workshops, Innovation Master Classes and Mentoring. ‘The benefit of innovation to businesses’ will be the key message at the iOTA Road Show in SIGNAL Centre of Business Excellence, Bangor on Tuesday 24 June 2014. iOTA helps people understand what innovation in business is, why it is important, and what help businesses can avail of. iOTA offers a programme of innovation support to local businesses including, innovation mentoring and advice, workshops, clinics and master classes. Businesses that visit the Road Show can avail of FREE advice and guidance from a range of organisations including Invest NI, InterTradeIreland, Federation of Small Businesses, ENI Loans Funds, HMRC, Bangor Town Centre Management and Chamber, SERC, Health and Safety NI and Business in the Community. The iOTA Programme which is part funded through the European Union’s INTERREG IVA Cross Border Programme is seeking to demystify the process of innovation and will help build innovation into local businesses. The iOTA Programme is an exceptional opportunity for existing businesses in the North Down and Ards area, to learn more about innovation and develop their innovation capability by accessing new skills, expertise and knowledge. The aim is to target as many businesses as possible to enhance their innovation capacity and thus contribute to the competitiveness of the region. Individuals and companies in North Down and Ards looking to develop their business should attend the iOTA road show. Paul Miller from Horizon Two Six will speak on innovation and the reasons why businesses should embed innovation into their business. Andrea Seay and Lynne Forde from Baskets Galore based in Bangor are 12 years in business and will speak about their journey from a garage to 3 warehouse complexes in England, Ireland and Northern Ireland and operating several websites. Paul, Andrea and Lynne will be available to give some innovation advice and direction to businesses during the day. Paul and will speak at 10.30 a.m. and again at 2.00 p.m. 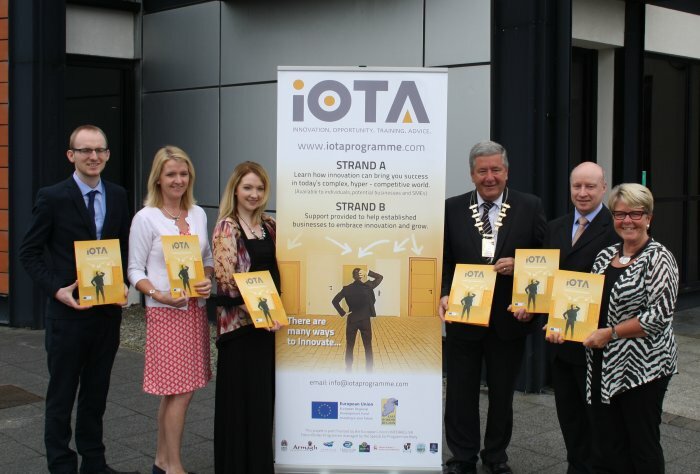 The iOTA Programme is open to individuals, micro enterprises and SMEs in the following council areas in Northern Ireland – Ards, Armagh, Banbridge, Craigavon, Down, Newry and Mourne and North Down as well as Counties Louth and Monaghan in the south of Ireland and will be delivered by a cross border consortium led by Newry and Mourne Enterprise Agency.